Population distribution and economic development at the national scale including voluntary internal migration, core-periphery patterns and mega-city growth. Two detailed and contrasting examples of uneven population distribution. With a population of 1.37 billion people (set 2016; source CIA World Facebook), China remains the world's most populous country. The growth rate in 2017 was estimated by the UN to be 0.43%, significantly lower than a world average of approximately 1.11% pa. The removal of the One Child Policy in 2016 may lead to an increase in this rate of growth in future years as China changes policy to tackle its ageing population. 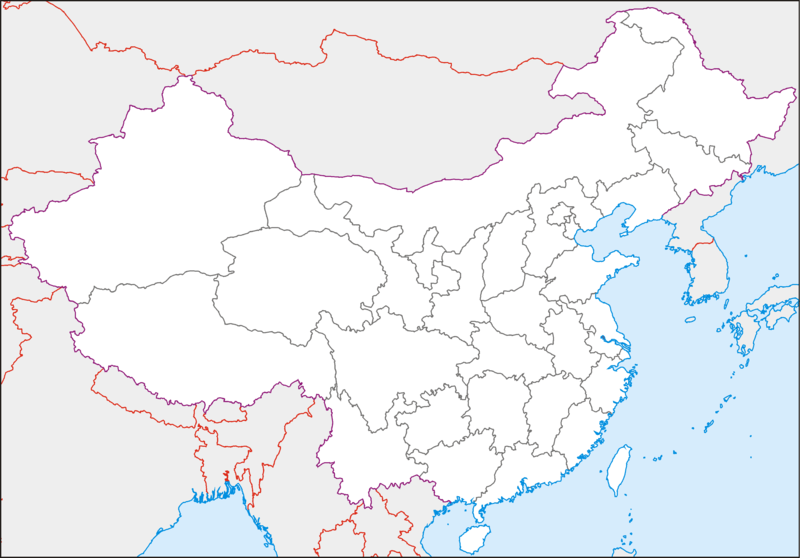 Although China has the world's largest total population, it has a land area of almost 9.6 million km sq; China's population density, at 141 people per square kilometre means that it ranks 79th in the world in terms of overall population density. 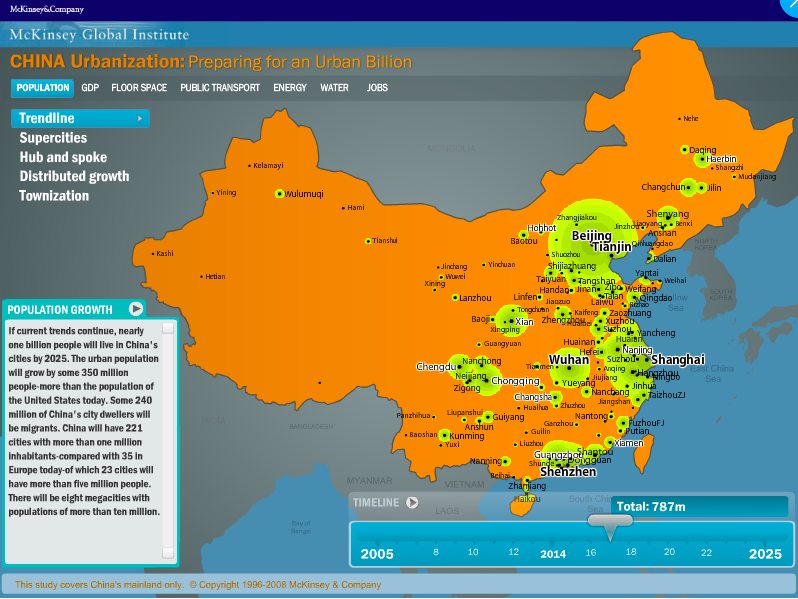 China's population is unevenly spread. This is a result of both human and physical factors which will be explored below. 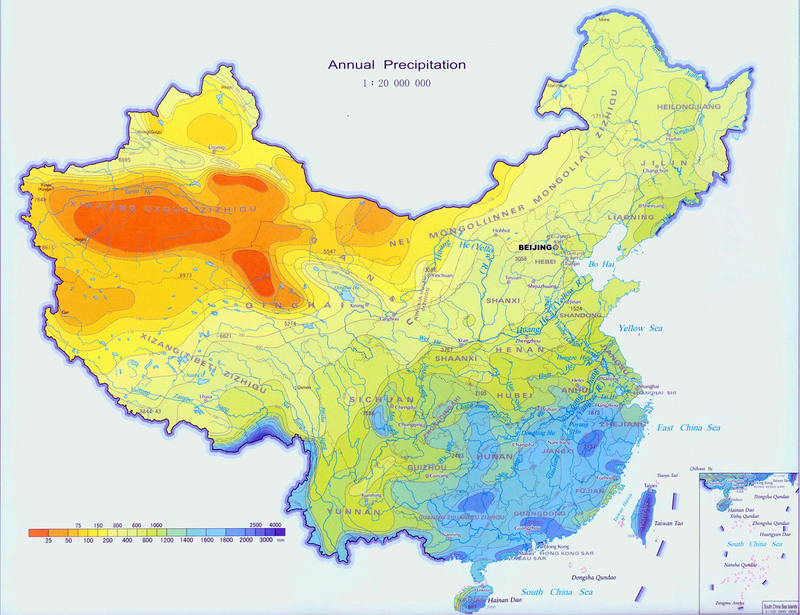 Now write a description of China's population distribution. You should refer to data, province and city names, the Hu Huanyong Line and refer clearly to north/south/east/west of the country. Use the maps below to begin to explain the variations in population density you have already identified. How does relief connect to areas of low and high density? What densities are found in areas of lowland and how does this compare to mountainous areas. Remember to name the areas/provinces you refer to in your answer. Explain the connections you identify. How do the patterns of precipitation and temperatures connect to variations in population density? 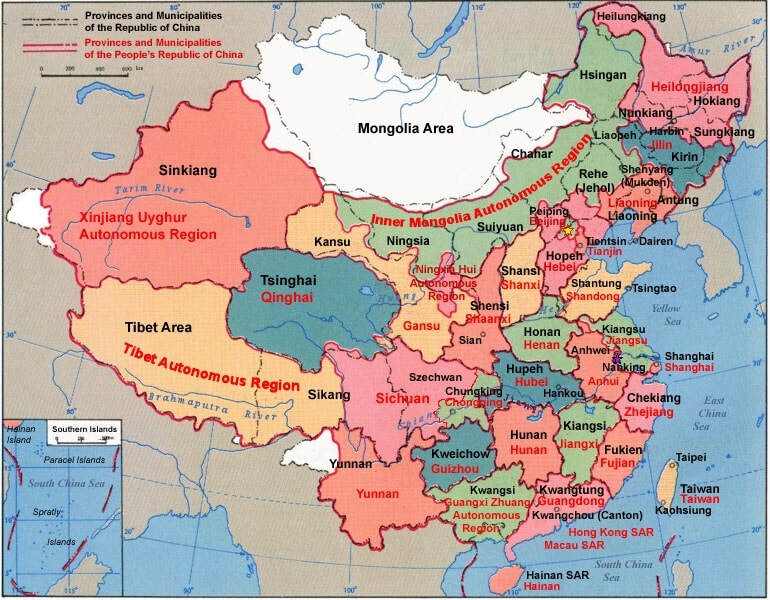 Until 1911, China was an imperial country, ruled by emperors who had total control over "The Middle Kingdom". A series of dynasties lasted from ancient times until the Qin Dynasty which lasted from 1644 till 1911. The emperors were regarded as "Sons of Heaven" and were reluctant to embrace progress or reform. In 1911, the final emperor was overthrown and a republican government was established under the leadership of Sun Yat-Sen and his party KMT. The Chinese Communist Party (CCP) was established in 1921. In 1926, political and philosophical differences between the two parties led to a civil war which concluded in 1949 with the CCP victorious and the communist leader Mao Zedong established the People's Republic of China. The Chinese economy was then subject to strong central control and a series of "Five Year Plans" and political/economic campaigns. Private ownership of land and of businesses was abolished. China's economy suffered from periods of great upheaval and social change, in particular the Great Leap Forward between 1958-1960 and the Cultural Revolution between 1966 and 1976. it is estimated that the Great Leap forward caused 45 million deaths. Mao Zedong died in 1976, ending the Cultural Revolution and starting a period of liberalisation and and opening of the Chinese economy. Mao was replaced by Deng Xiaoping who focused on the economic development f the country and worked to build ties with the outside, capitalist world. foreign investment was encouraged for the first time and Special Economic Zones were established in Shenzhen and Zhuhai initially. The government introduced incentives for private enterprise. Consumer and export sectors of the Chinese economy grew rapidly and an urban middle class developed, particularly in the cities of the east coast such as Shanghai, Shenzhen and Guangzhou. Living standards, literacy, life expectancy and GDP all increased. In 1992 Deng Xiaoping declared that "to be rich is glorious". China's economic growth averaged 13% per year in the 1990s and, although this growth has slowed in recent years, China has had the world's greatest growth for more than 30 years. While all areas of the country have benefited from this economic growth, most growth has been focused in the east, especially in the coastal provinces. It is estimated that more than 700 million people have moved out of poverty in the last 30 years with hugely improved access to education, health care, electricity and running water. The focus os this growth remains in the east and the gap between the richest and poorest in Chinese society has grown. This has led to massive, often state sponsored migration to regional cities and from poorer to richer provinces. Coastal provinces therefore tend to be more outward looking, have much greater access to world markets, education and expertise and have benefited greatly from Foreign Direct Investment. This has enhanced the benefits these provinces already have through physical characteristics of relief, soil, rainfall and temperatures as well as their coastal locations. 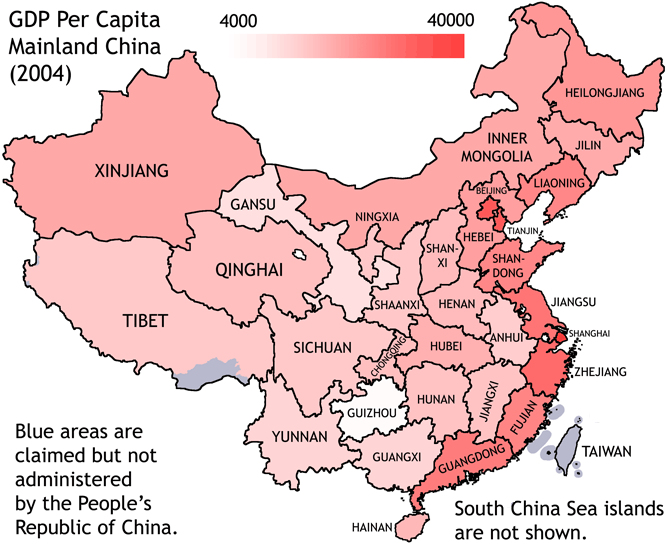 To what extent can you see a connection between the wealth of provinces in China and their population density? 2. 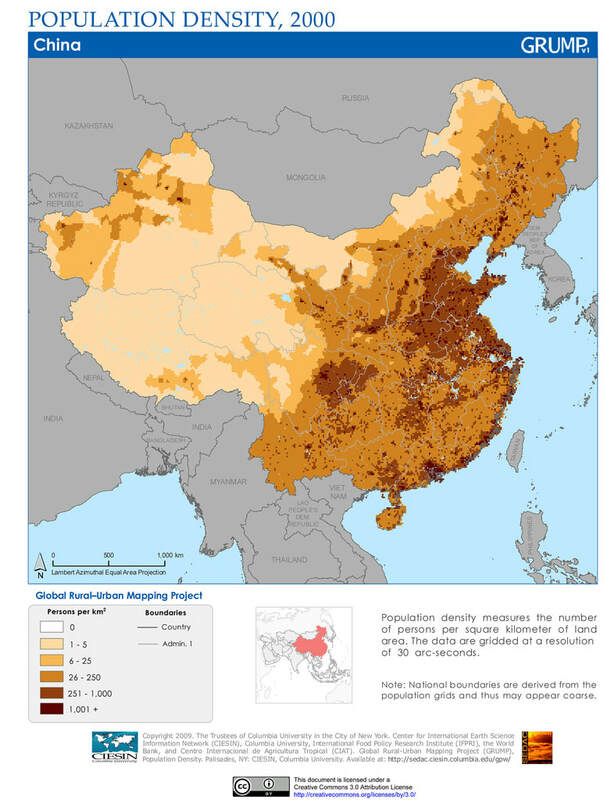 Is there a correlation between GDP and population density in China? Use the data in the spreadsheet below to draw a scattergraph showing population density against GDP. Identify and describe the pattern shown. What are the overall trends? Quote data to support what you say. Which provinces are anomalies? Suggest reasons. Now use Spearman's Rank Correlation Coefficient to investigate the strength of the correlation between the two sets of data. What are your overall conclusions? Explain.